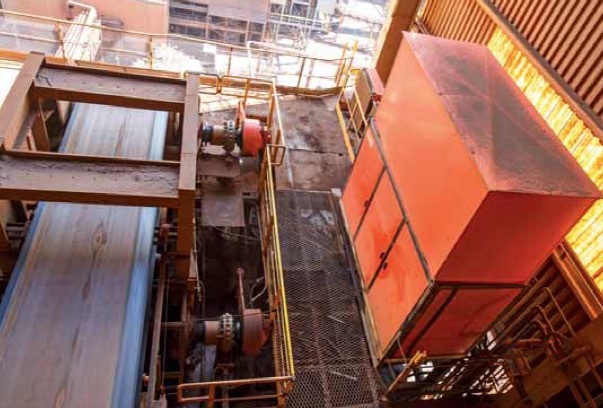 A Brazilian mine producing some 40 million metric tonnes of iron ore each year has for the first time equipped one of its belt conveyors with a Hägglunds hydraulic direct drive system. This installation has led to clear and substantial improvements in the conveyor’s safety and reliability. With their directmounted motors, infinitely variable speed and resistance to shock loads, hydraulic direct drive systems combine peace of mind with high productivity. This is why one Brazilian multinational producer of iron ore chose to install a Hägglunds direct drive from Bosch Rexroth on one of its conveyors. The variable speed also enables precise control and positioning, for example when inching the belt for inspection. Perhaps most importantly, however, the excellent controllability allows the conveyor to be soft-started, which minimizes stresses on belts, other components and the machine structure. Measurements show that the mine’s conveyor moves around 2,700 tonnes per hour with the Hägglunds drive system, which is slightly more than with the original drive. With the system setup and electric motor power now installed, it is actually possible to substantially increase the speed or torque without affecting the service life of the drive. Drive and control technology from Bosch Rexroth moves machines and systems of any size. The company bundles global application experience in the market segments of Mobile Applications, Machinery Applications and Engineering, and Factory Automation to develop innovative components as well as tailored system solutions and services. Bosch Rexroth offers its customers hydraulics, electric drives and controls, gear technology, and linear motion and assembly technology all from one source. With locations in over 80 countries, more than 31.100 associates generated sales revenue of approximately €5.4 billion in 2015.